We have rules to help ensure a fair, safe, enjoyable competition for everyone. 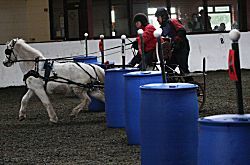 The ICD indoor rules are based on FEI outdoor horse driving trials rules, adapted for a one day indoor competition and are available free of charge here. Rulebook reissued for 2018-19 - please read! Please click here to download the latest rule book (2018 on). To see the detail changes, please see latest rule book with change marks from 2017-18.
here for paces and precision tests. This was discussed at Keysoe 2104. Documents available for download on this site are in Adobe Acrobat format. If you don't have this software click on the Adobe icon to get it.